L I V I A: BIORE SKINCARE SPECIAL - FEAT. CHARCOAL CLEANSER, DAILY DETOXIFYING SCRUB & DEEP CLEANSING PORE STRIPS REVIEW ! 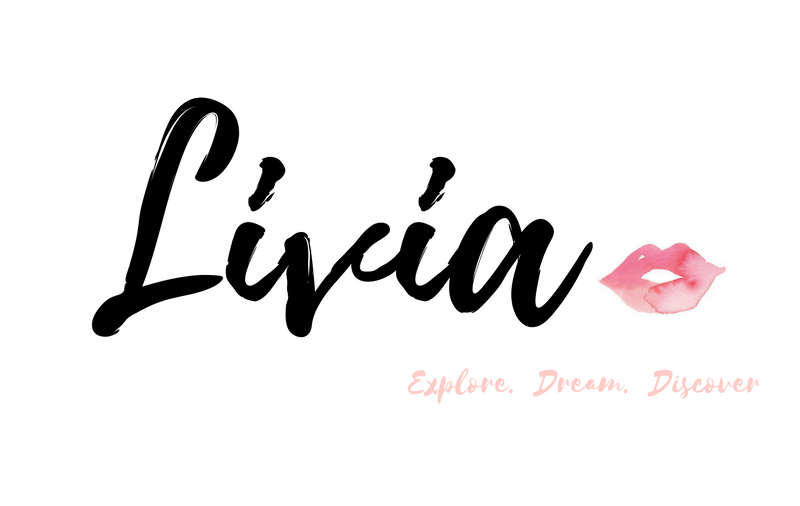 BIORE SKINCARE SPECIAL - FEAT. CHARCOAL CLEANSER, DAILY DETOXIFYING SCRUB & DEEP CLEANSING PORE STRIPS REVIEW ! Hope you're all well rested and have all done your daily skincare routine! What a perfect way to clear our your pores using deep cleansing nose strips by Biore, followed by using their detoxifying scrub which clears any dead skin skills on your skin and finally popping on their Deep pore Charcoal cleanser which deeply cleans pores. I am big fan of nose strips only because they're really simple and convenient to use on the go or whenever you feel like your nose is really clogged by dirt and oils. 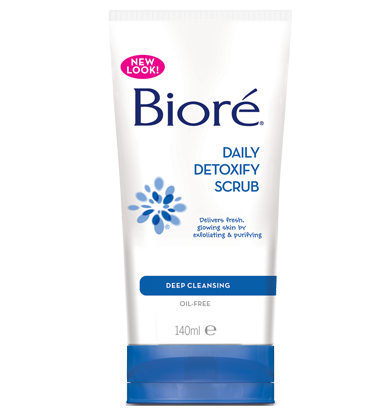 I really believe in Biore as a brand for me because their products are top notch and does its job. They have recently revamped their new look to some of their products and I am totally loving their new fresh look of the packaging. For the all three products mentioned above, they are effective products in removing dirt and grime trapped in your skin, and for the nose strips - they're an easy option to get a better grasp of the trapped pores on your nose. 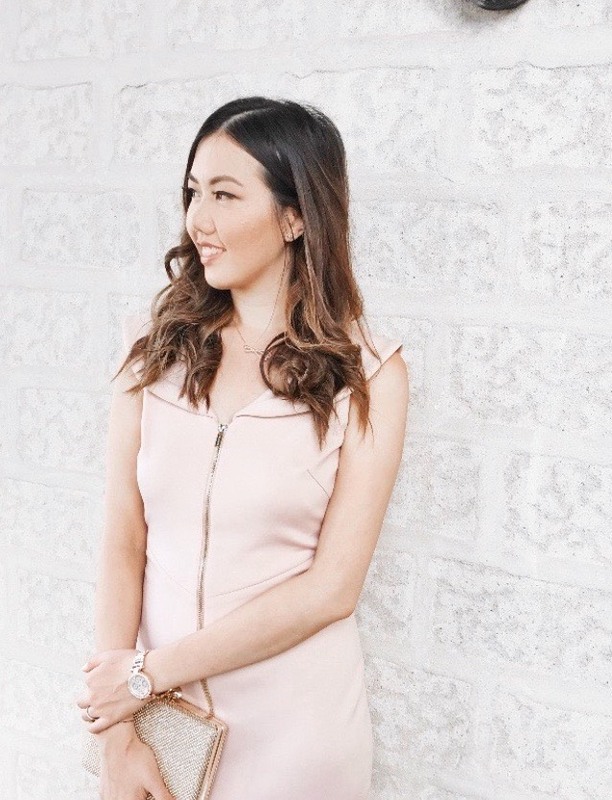 By using all of three products as an evening skincare routine, I noticed my skin looking very clear and cleansed. I am impressed by their Charcoal cleanser because not only does it clean really effectively, it's such a fun product to use every night as part of my skincare routine. If it's been a while since you've used Biore strips, you would notice that they've changed the packaging (which stands out more and I quite like the new look of it). The 6 pack Biore nose strips is designed to remove the dirt and grime from your nose pores and reduce the look of pores gradually. With first time use, all your blackheads won't get removed - but with gradual use of these strips, you'll find that you'll get less blackheads. It really is made to be used in the long-term because you want to really cleanse out the pores of your nose and remove any dirt and grime trapped. I found the nose strips to be very innovative looking as it comes with slits to accommodate to fit on your nose. I would keep in mind when using nose strips, is to be very gentle when removing the strip. I would recommend to leave the strip on your nose to dry for no longer than 15 minutes. After that time, be sure to gently remove from the corners and peel back slowly. Also, make sure to apply the strip on areas of where there are more blackheads because you want to see results! The box comes in a 6 pack but I'm sure there are other boxes in pack of 8 or 10 which you can also pick up at your local chemist. For any new users of Biore strips, be sure to gently wet your nose with water before applying the sticky side of the strip onto your nose. The results I've gained from using the nose strips is that I saw the dirt and oil visible on the strips. My pores on my nose was really cleansed out and I was really happy with the results. With longer use, say on a weekly basis - If I continue to keep using the strips on my pores, I can definitely see my nose being super squeaky clean. Overall, a good product for removing blocked and clogged pores on your nose, I'm giving this a 5/5 stars! Removes impurities and clogged pores from your nose. Convenient and very easy to use. Peel from the corner gently when removing the strip. Don't leave the strip on for more than 15 minutes. This is an amazing daily scrub which really detoxifies by exfoliating and purifying your skin to give you cleaner and glowing skin. What makes this product so special is that it's combined with gentle cleansing ingredients and combined with the exfoliating agents, it removes toxins from your skin's surface where it gives you more of a fresh and glowing complexion. It has been infused with natural ingredients such as aloe, sage, rosemary chamomile and nettle where it acts to thoroughly clean the skin making smoother. I used this everyday as a day and night scrub to really see if it works for me. I found it to be super effective and I've had more luck with this scrub when it comes to removing all of my make-up and sunscreen off for the day. I did not need to use a large amount of product, as a little goes a long way for this superb scrub. It smells amazing and pleasant when using it and I don't think I'll get sick of this scent. It's not harsh nor did I experience any redness so I am pretty happy about that. The product rinses off very easily under lukewarm water and you'll find that your skin will look super refreshed and clean. The scrubs are in tiny sphere form and it's not that harsh when scrubbing on skin. I would definitely consider packing this in my luggage for if I went overseas because it's a brand that I can truly trust when it comes to really giving me a cleansed face. To make things easier, you can choose to use this scrub while you wash your face in the basin or you could do this in the shower. My skin felt hydrated and fresh and I experienced no dryness when using the scrub. I made sure to moisturise my face after exfoliating because you want rehydrate your skin once you go through a scrubbing session. This product is perfect for those who suffer from blackheads and breakouts. If you have enlarged pores all the time and just want to minimise the appearance, then this product with aid you in keeping it super clean. This scrub did not clog my pores nor did it make my face to appear oily - in fact the scrub is oily free. What is also great is that, it is suitable for ALL SKIN TYPES including sensitive skin. To use this product is simple and you just start to wet your face. Next, you just have to squeeze product onto your hands. Massage this over your whole face making sure to avoid eye areas. Next, rinse with lukewarm water. Lastly, be sure to moisturise your face after the process. The tube comes in a 140ml bottle where it's easy to squeeze out product for when you're in the shower. 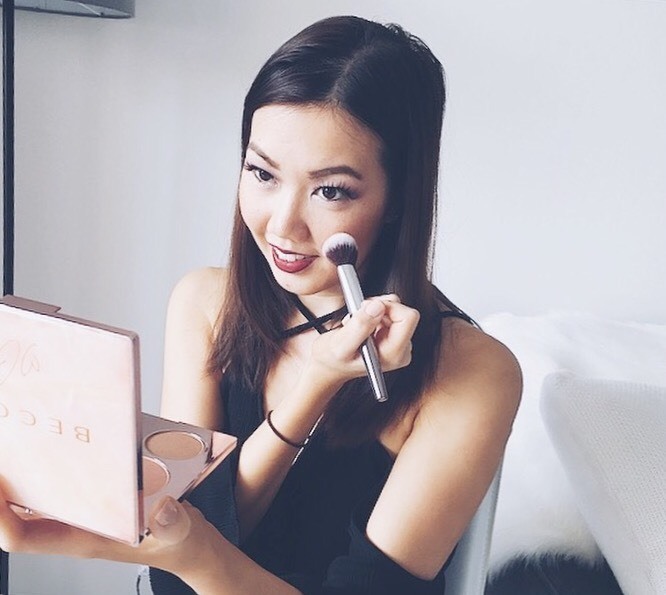 It's absolutely mess-free and it's so convenient to carry around in your make-up bag for when you do go travelling. A top notch detoxifying scrub which effectively works to gradually reduce the look of clogged pores from time. 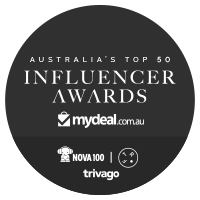 I am giving this a 5/5 stars! Detoxifies and exfoliates clogged pores on your skin. Makes your skin feel super refreshed and clean. Scrub beads are in tiny sphere form. Massage the scrub with your fingers onto your face and blackhead prone areas. Ok ladies, listen up! If you're into something new and want to try out a charcoal based cleanser, keep on reading... 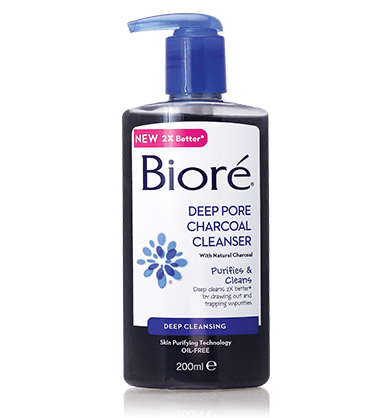 This charcoal cleanser by Biore is designed and infused with Japanese Skin Purifying technology, works by drawing out trapped dirt on the skin, foams up white to where it cleanses the skin really well. Don't be intimidated by the colour, but instead think of it as new product innovation that will cleanse your skin effectively. I have oily to normal combination skin type and I'm often faced with a few blemishes and blackheads due to having oily skin. When I first used this cleanser, the black coloured charcoal basically foamed up to whitish grey colour. The smell isn't too harsh so I didn't really mind it. When applied onto the face, I felt a slight tingle and refreshing feeling on my face, almost as if the ingredients are instantly activated when mixed with water. The product is presented in a pump bottle which is convenient for when you want to cleanse your face in the shower. You don't need a great amount of product when using this, just a tiny amount will do. This cleanser did a superb job in cleansing my face from the make-up I had during the day. It left it clean and my sunscreen and foundation on my skin were all cleansed away effectively. I felt no dryness to using this charcoal cleanser and I would definitely look to use this in the long-term. So far, I have not noticed any blemishes on my skin after using this cleanser and I am so glad that my complexion is looking as clear as ever. How this cleanser works, is that it cleanses pores deep down getting rid of any impurities without giving you any skin irritations or redness. I've always been curious of Biore's Charcoal cleanser and finally I got to use it. I am amazed by the results of how well it can effectively clean my skin leaving it feeling soft and refreshed. It does the job and would make an ideal cleanser for mornings and nights if you're always on the go and have a busy lifestyle. I am definitely giving this a 5/5 stars! It has Japanese Skin purifying technology. It works by drawing out trapped dirt on skin through its charcoal cleanser. Cleanser foams up white giving you a clean and refreshed look. Prevents blemishes from surfacing up from time. Great for those who have blackheads and blemishes. 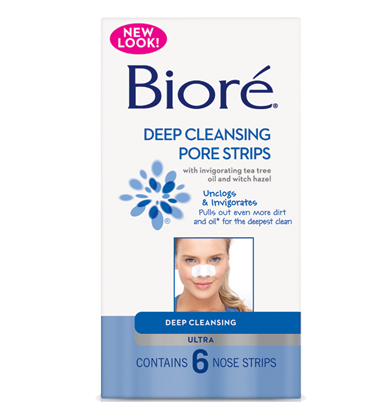 I've always used Biore from a young age, especially with nose pore strips and I am always satisfied when it comes to using products from their range. They are effective in cleansing my skin and pores and I am happy about the results that it has given me so far. 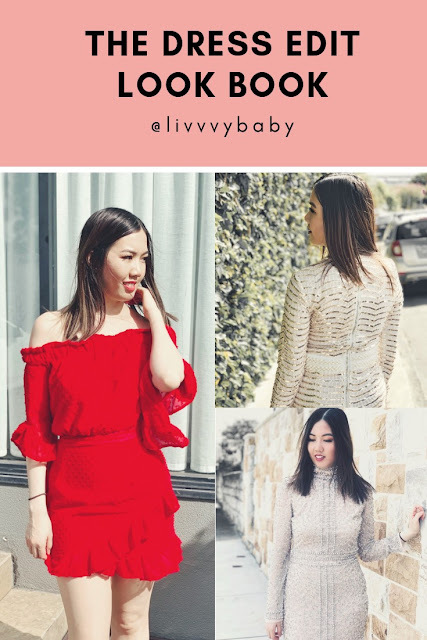 I hope you enjoyed reading all about my favourite brand Biore!